While we are constantly editing research material to ensure that authors and researchers go on to being published, an insight into what leads journal editors to accept articles is important. 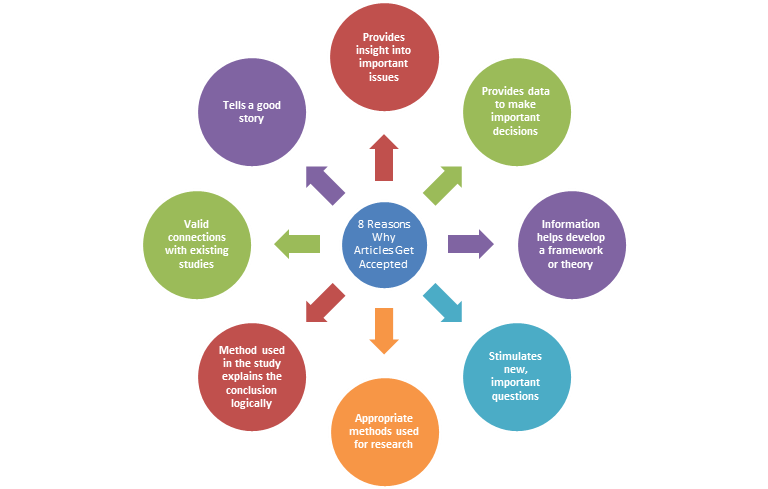 The following infographic addresses the following question: What are the top eight reasons a journal accepts a paper for? It provides insight into an important issue– for example, by explaining a wide variance when numbers are spread out from the mean or expected value, or by shedding light on an unsolved problem that affects a lot of people. The insight is useful to people who make decisions,particularly long-term organizational decisions or, in our particular field, family decisions. The insight is used to develop a framework or theory, either a new theory or advancing an existing one. The insight stimulates new, important questions. The methods used to explore the issue are appropriate(for example, data collection and analysis of data). Connections to prior work in the field or from other fields are made and serve to make the article’s arguments clear. The article tells a good story, meaning it is well written and easy to understand, the arguments are logical and not internally contradictory. “Ideally, we would like to see articles perform well on all eight points, and that the author strives for a good balance amongst these criteria,” said Dr. Pieper said.